PROMOTING COMICS (or pretty much anything) THROUGH PODCASTS – INDIE VOLT! During Motor City Comic Con in Novi Michigan (May 19-21) The Host of Comics Pros and Cons Derek Becker and Dirk Manning the author of WRITE OR WRONG: A WRITER’S GUIDE TO CREATING COMICS from Caliber & Bleeding Cool as well as a host of other projects such as Tales of Mr. Rhee from Devils Due and Nightmare World from Image & Shadowline, blessed the hungry masses of those looking to get into comics (really the message applies to anyone who’s looking to get more eyes on their indie product) with a panel on how to select the best podcast to appear on touting your newest creation! If you have any questions or comments sound off in the comments section below and we’ll see to it that Derek or Dirk OR MAYBE EVEN BOTH get you an answer as soon as possible! 1. They appreciate your work, and they enjoy learning about who you are as much as they enjoy learning about what you have created. 2. They want to share your work with their audience because they feel it’s something that should get more exposure. 3. They want to reach a new audience too – let’s be honest once more, podcasts thrive on sheer numbers of listeners. If they can bring in more listeners because you have a following, that’s a win for them as well. These days it seems everyone has a podcast. Last time I checked, I personally know close to 100 people that have an active podcast, and many of them have multiple different podcasts. It’s not hard to find a podcast to be on if you really want to, but what is difficult is finding one that has the reach or the audience that you need, and ideally, you would like to have both at once. With all that in mind, here are some things I recommend if you would like to be a guest on a podcast. If the podcast you’re looking at doesn’t interview guests but they do review comics, this will also apply. It’s all about the selection process. Just like looking for a new job, ask yourself if you want to be a part of that organization. Ask yourself some basic questions. Do they have similar values? Do they have similar goals? Are they people you would want to talk to if there wasn’t something in it for you? 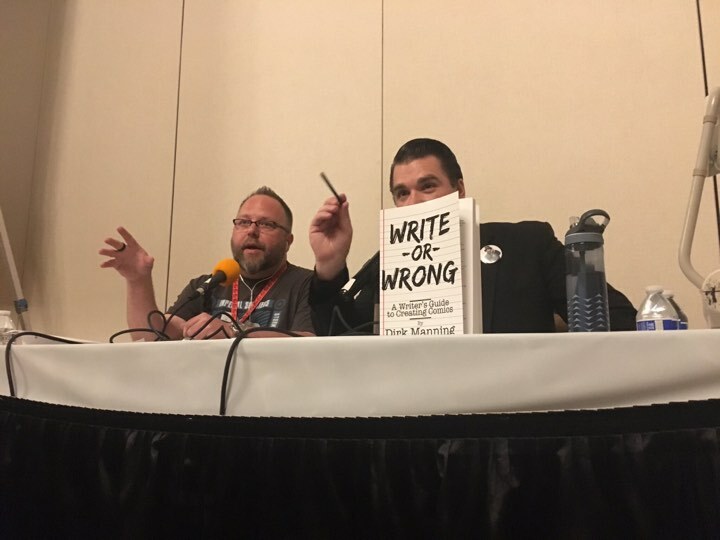 If you are relatively new to the comic industry and you don’t already have a massive following, the first thing you should do is narrow down the podcasts to a handful or even a couple dozen you want to be on. Next, prioritize them, and you may even want to have 2 different lists: First, compile a list of shows you dream about being a guest on (like The Nerdist with Chris Hardwick or anything that Kevin Smith does). Then, look at shows you actually have a much better chance at being a guest on, like, oh I don’t know, maybe Comic Pros & Cons with Derek Becker. If you are lucky enough to have a following, then this will still apply, but you will probably have podcasts approaching you to be on their show. That said, they may not always be the ones you want to be on. There are a few things to look at when trying to decide what podcasts would best suit you. Look at the topic(s) they cover. This will be up to you to decide because you should have a better handle on who your audience is, or if you are brand new, who your potential audience will likely be. It is ultimately up to you to determine if you want to be on a show that about something as off the wall as dogs and saltwater aquariums. It might be worth it if one of the hosts consistently makes comic book references, but if your comic happens to be about dogs or saltwater aquariums, that could be a great place to go to reach a new audience. Obviously, you want to go after comic book fans first, but don’t forget that if your comic has a different subject matter, look to the media outlets that cater to that market as well. This topic will be touched upon again later, but do your research before contacting them. If you don’t want to be associated with people who say things you don’t agree with, make sure you know what kind of show they produce before you are eternally linked via the internet. Remember, once it’s on the internet, it’s out there forever. The flip side of that coin is the more you agree with what the hosts say, the more likely their listeners will agree with you as well, giving you a better chance at converting their audience to becoming one of your fans. What you need to consider is not only who their audience is, but also what kind of reach they are getting. It’s ok to ask a podcast what kind of numbers they are pulling in, but use your best judgment based on what kind of data they give you in return. Not all podcasts will give you their numbers, nor will they always give you real numbers. In some cases, they just flat out don’t know what their numbers truly are, because getting solid stats from places like iTunes is virtually impossible. There are things you can do as well, such as looking at their social media. If a podcast claims they are getting half a million downloads per episode but they only have a couple thousand followers on Twitter and Facebook, they probably aren’t getting what they say they are. Also, don’t hesitate to ask them the demographics of their listener base, such as age, gender, geographic location, etc. While they probably won’t have exact numbers, analytics from Facebook, Twitter, and other social media go a long way. In some cases, they may have even been able to get some statistics from their own website as well. Every podcast will be different and there is no formula to give you a “follower to listener ratio”, but it is a good barometer to see if they have any kind of following at all. The best podcasts out there will not only have a large number of followers, but they will have a fair amount of engagement as well. One last thing regarding researching social media, just as you should be concerned with what a podcast says on their shows, you should be concerned with what they say on their social media. Once again, if you don’t want your name tied to certain viewpoints, perhaps that is not the podcast for you. The final thing to consider when looking at audiences is this: size doesn’t always matter. It may be far more beneficial to be featured on a podcast with 400 weekly listeners that fit your target demographic than it would be to be a guest on one that boasts 400,000 if only 4 of those listeners care about you or your work. Look at how they promote their show and themselves. You have already looked at their social media, but did you take the time to see how they promote their show? Do they promote it at all? What does their website look like? Most podcasts will post their newest episode once or twice on each social media stream. The key to look at is not how often they are posting the episode on their feeds, but how they are doing it. Over posting typically leads to them losing more social media followers than they can gain. Thus, being very decisive and precise on when and where to post is actually more important than how often they post on social media. 1. Are they tagging the creators or their pages on Facebook and Twitter? 2. Are they putting hyperlinks in their posts on their own websites? 3. Are they sharing or retweeting episodes on their own personal sites? You want someone that is going to push their product out as much as you try to push your own. If they aren’t putting in the effort, it might not be worth your time and effort either. Now that you’ve selected a show (or a few dozen), it’s time to reach out to them. There are a number of ways to contact a podcast, and each approach is going to be a little different. Whether it’s via email, social media, or even in person i.e. at a convention or some other industry gathering, the key is in how you present yourself. Just like submitting a job application, most good podcasts get hundreds of requests a year (if not every month or week) asking to be interviewed, promote or review their book, or push their Kickstarter. If you want to be featured, you need to stand out from the crowd. Obviously, your work has to be good, but it is important to remember if you are reaching out to them, there’s a good chance the first impression they’ve never seen your work. Everything hinges on you delivering the best possible message you can. Make sure you write a well-crafted introduction. While this should go without saying, but your introduction should be free of spelling and grammatical errors. This goes double if you are a writer. If you sound uneducated, most podcasts will not even go any farther than your intro. Most importantly, be professional in your introduction. Keep in mind that while many podcasts may be crazy, zany, funny or silly on their show, when they are off air, they are being treated like a business. They are still going to have fun, but business acumen will surpass emotion when it comes to choosing guests 90% of the time. Podcasters like attention. If they didn’t, they wouldn’t have a show. More so, they like to feel recognized and appreciated for what they do. Reference that you’ve listened to their show. Podcasts are much more likely to want to talk to you and read your work if you can show that you have taken the time to listen to them as well. Don’t assume that they know you or your work by name – give them a detailed bio with links to your website and/or social media. Don’t make them do the work to find out who you are. If you’re new and don’t have a lot to talk about, be honest. Everyone has to start somewhere, but if you have a powerful introduction, you can still get people to look if you approach them properly. Send them a copy of your comic book. Do not expect or assume a podcast will pay for your book. It’s not that they don’t want to support the comic industry, it’s that this is a mutually beneficial situation. They are giving you free promotion, and while you are helping them create content for their show, conversations are much more difficult if the person you’re talking to doesn’t have something to reference. If needed, you can always have them agree to certain terms and conditions, or have them sign a privacy agreement stating they will not share or distribute your material without written permission. Congratulations! Someone is bringing you on their show! Now what do you do? Not all podcasts are the same, so doing some preparation on your end should make for a much more pleasurable experience for you. The added benefit to you putting in a little extra work is the final product will probably be much better as well. This may be obvious, but it’s worth mentioning as it has caused many issues for many people: if recording your episode over the phone or via Skype, make sure you clarify what time zone you are in. Also, if you are using something like Skype, it is highly recommended you share your contact info in advance just so there aren’t any unexpected issues when recording time comes. It would seem like the more shows a comic creator can be on, the more exposure they will get. While this is true, there is a caveat to this line of thinking. If you are pushing the release of your new book, a crowd funding project or some other announcement, you definitely want to get the word out as much as you can, however, there is some consideration that should occur when doing so. Talk to the podcasts you are going to appear on and inform them of the other shows you are doing. Podcasts that share similar topics and/or formats will very likely share listeners as well. If you hit up multiple podcasts to announce your new Kickstarter, having all of them release your episode in the same week can actually be detrimental to your promotion. Say a fan downloads 10 podcasts a week, and because they only listen to comic book based podcasts, you are the featured guest on 7 of the shows they are subscribed. The chance that a fan will actually listen to all 7 episodes in a week that features the same guest is pretty slim, so try to space them out as much as possible. Also, discuss the scheduling strategy with the podcasts, as they may have a very good idea of which shows they do (or do not) have a large crossover with already. Lastly, if a podcast feels like they are the only show you are appearing on i.e. they have an exclusive interview, and then they see you are on every show in the “podcast circuit,” they may be less likely to want you back as a guest the next time you have something to promote. This goes back to playing to the egos of the podcasters. Honesty is always the best play. No one likes to have extra expenses, but if you plan on doing multiple podcasts via Skype, Google Hangouts or some other internet video chat service, a good microphone a set of headphones goes a long way. At the bare minimum, look into investing in the mic. A simple pair of ear buds or headphones will help reduce echo and will also give you a better idea of how much background noise is coming from your end. Remember, if your audio sounds bad, no matter how good the content is, people will turn it off and stop listening. If you’re going to be doing an interview, remember every podcaster has their own style as well as varying levels of experience. Some will come into the interview with literally dozens of questions they want to talk about, while some are more comfortable having their guest lead the conversation. If you’ve done your homework and listened to a few of their shows, you’ll probably be able to tell which type of interviewer they are. With that in mind, having some pre-set topics can make things a lot easier for you and the podcaster. Even if the person you are planning on talking to is renowned for having a massive list in advance and being super prepared, it never hurts to have the notes handy for your own reference. This is a difficult one and may even sound counterintuitive when the previous tip was about preparing talking points in advance. The challenge lies in that you are going to have to give some kind of a premise to your book or books, but you want it to sound natural. If you have a canned speech or elevator pitch that you use at conventions or on every podcast, change it up. If you’ve said the exact same thing hundreds or even thousands of times, it’s going to sound like it. Also, if you are saying the same thing on every podcast, you need to consider that many people listen to more than one show. If they’ve heard it from you on one or two other shows, they are going to assume you will be saying the same thing on every other show from there on out. If that is the case, people will be less likely to listen to another podcast on which you are appearing. If your elevator pitch sounds flat, you are going to have a harder time getting the listening audience to connect with you. Make sure you have excitement in your voice when you’re talking about this because this is going to be the first chance many people will have to hear about your work. The best podcasts are really good conversations, so keep in mind just because something sounds great on paper doesn’t always sound good when recited. Many podcasters are afraid to ask their guests, “Is there anything you do not want to talk about?” It’s a rare occasion that someone has something they don’t want to discuss, but if you are concerned about a topic being brought up, let the host know in advance. The host may not realize their guests have some sore spots or pain points, so make sure to speak up if they don’t ask you in advance. Normally you can avoid any issues like this if you clearly tell the host in advance what types of things you would like to discuss. With enough warning, most podcasts can customize their interview to what you want to talk about. Getting interviewed on a podcast is a great way to promote yourself, your work, and even upcoming books or crowd-funding projects. With that in mind, if you are only there to sling your books, you will have a more negative result than what you were aiming for. There are a number of different ways to bring these up in conversation, but avoiding the full sales pitch will benefit you more than you will know. Going full press sales in a podcast is the equivalent of the carnival barker at a con saying, “Can I tell you about my comic book?” Sure, you may sell some books, but you’ll find other podcasters will be less likely to want to have you on their shows as a result. In short, make it personal, show your passion, and keep it conversational. For the most part, once you’re done recording, there are very few things the podcast will need from you, however, there may be a few things you will want to provide to the podcast before they release your episode. Any additional information should be requested by the podcast, but having all of these things handy will improve the chances that the information you want out there will be. Hurray! You have successfully recorded a podcast with someone! Now you can sit back and watch your popularity rise without doing anything else, right? The vast majority of the responsibilities are in the hands of the podcast, but there are a few more things you should do. At this point, the podcast will edit the audio, convert it to the proper format, write a post for the episode which will appear on their website or another hosting service site, and release it at the proper time. However, there are a couple of tasks that can be done to greatly increase the success of your episode. Building up hype for an upcoming episode of a podcast is no different than it is for releasing a comic book. You want your audience to pay attention when it’s released to increase the number of your fans that will download and/or stream your specific episode. Retweet and share your episode once it has been posted. Social media is always the easiest way to do this, although website and email announcements are other successful ways creators have promoted their appearances. As stated before, podcasts will post a handful of times about each episode, but if you tag them in your posts, there is a very good chance they will retweet and share your posts as well. As stated at the beginning of this article, the mutual benefit of creators appearing on podcasts is sharing their audiences. The best results a creator can get is from reminding their fans a few weeks or months after their appearance on a podcast. The best part about podcasts is they don’t go away and can be downloaded long after they were released. If you were happy with the end result of the podcast you appeared on, throw out the link again after the initial buzz has died down. It is important to remember that people are being flooded with information on social media, and repetition can be the best solution to get them to take notice. As stated earlier, there are a ton of podcasts out there, and podcasts tend to know (or at least know of) other shows that fall within the same realm of interest. Ask the host(s) if they know of any other podcasts that they know that might be interested in having you on as a guest. While you don’t want to go on every show during the same short time span, it never hurts to get an introduction where possible. Derek also gave us a link, where you can hear the panel as it was originally recorded which you can listen to here!